KVS Teaching, Non Teaching posts Recruitment Exam dates, Admit Cards 2018: KVS Teachers Recruitment Exam dates, Admit Cards 2018. Kendriya Vidyalayas Teachers Recruitment Exam dates, Admit Cards 2018. 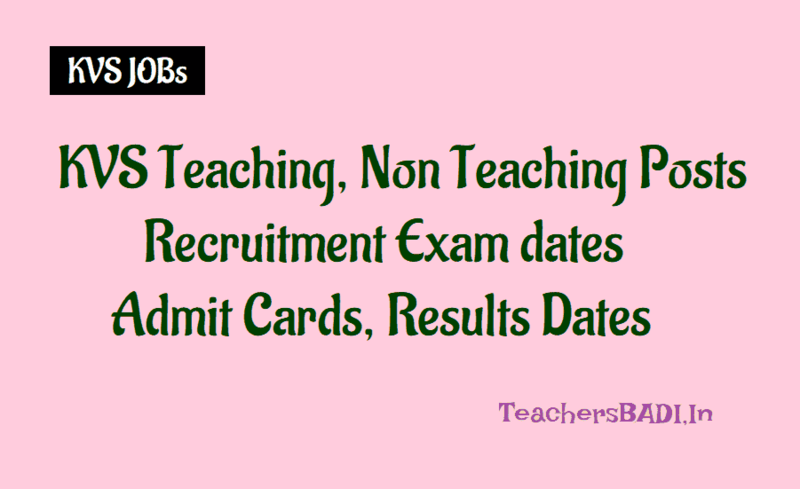 KVS PGTs, TGTs, PRTs, Librarians Recruitment 2018 Exam dates, Admit Cards. The Kendriya Vidyalaya Sangathan (KVS) has published the examination schedule for the KVS Teacher Recruitment 2018 exam on the official website, the link for which is kvsangathan.nic.in As per the schedule, the KVS will conduct the exam from December 22 to December 23 at various test centres across the region. KVS teaching, Non teaching Posts 2018 @ Kendriya Vidyalayas: Each state Kendriya Vidyalaya Sangathans, an autonomous organization under the Ministry of Human Resource Development, Government of India would issue the teaching posts 2018 recruitment notification and each state, KVS invites applications from the Indian Citizens for recruitment on teaching posts (Primary Teachers (PRT), Trained Graduate Teachers, Post Graduate Teachers for the year 2018-19. Candidates are required to apply in the prescribed Performa only, available on each state KVS website under the head “Employment Notice “. No other format/ Performa other than the prescribed one shall be entertained. Kendriya Vidyalaya Sangathan (KVS) will release admit cards for the teacher recruitment exam scheduled on 22 and 23 December 2018 for North Eastern region. Candidates who had registered for the exam can now download the admit card at the official website kvsangathan.nic.in. KVS had released the exam time table. While recruitment exam for PGTs and PRT will be held in 22 December, it will be held on 23 December for TGTs. The exam will be held for selecting candidates for t teaching posts in Assam, Meghalaya, Arunachal Pradesh, Nagaland, Manipur, Mizoram and Tripura. (a) Two Years’ Integrated Post Graduate M.Sc. Course of Regional College of Education of NCERT in the concerned subject. OR Master’s Degree from a recognized university with at least 50% marks in aggregate in the following subjects. Note :Candidates having Special B.Ed are not eligible for the post of PGT. 1 TGT (Hindi) Hindi as a subject in all the three years. 2 TGT (English) English as a subject in all the three years. 3 TGT (Sanskrit) Sanskrit as a subject in all the three years. 4 TGT(S.St ) Any two of the following: History, Geography, Economics and Pol. Science of which one must be either History or Geography. 6 TGT (Science) Botany, Zoology and Chemistry. 1 PRIMARY TEACHER Essential: i). Senior Secondary School Certificate with 50% marks or Intermediate with 50% marks or its equivalent. ii). Pass in the Central Teacher Eligibility Test (CTET) conducted by the CBSE in accordance with the Guidelines framed by the NCTE for the purpose. iii. Competence to teach through Hindi & English medium. Desirable:Knowledge of Computer Applications. 1. For the post of Primary Teacher, the candidate should posses two years Diploma in Education (D.Ed.) or Bachelor in Elementary Education (B.El.Ed). 2. The candidates having professional qualification B.Ed or B.Ed (Special Education) are not eligible for the post of Primary Teacher. 8 1. Ex-Servicemen (Unreserved/General) (For Group-B posts only) 03 years after deduction of the Military Service rendered from the actual age as on the closing date for receipt of applications. 2. Ex-Servicemen (OBC) (For Group-B posts only) 06 years (03 years + 03 years) after deduction of the Military Service rendered from the actual age as on the closing date for receipt of applications. 3. Ex-Servicemen (SC/ST) (For Group-B posts only) 08 years (03 years + 05 years) after deduction of the Military Service rendered from the actual age as on the closing date for receipt of applications. Note: All the concessions mentioned above will be concurrent, i.e. if a person is eligible for more than one concession, only one of the concessions of the highest permissible limit, will be granted. 2.3: The Cut-Off date for determining various eligibility criteria (Educational Qualifications, Age Limit, Experience etc.) will be 31.10.2018. Applicants must satisfy about their eligibility as on 31.10.2018 before applying. The KVS will take up verification of eligibility conditions with reference to original documents only after the candidates have qualified for interview. Only those OBC categories which are eligible for appointment under Central Government will be considered. (a) Candidates will be selected on the basis of their performance in written examination and interview put together. The KVS reserves the right to decide the cut off marks in written examination and interview separately. The decision of the KVS about the mode of selection to the above posts and eligibility conditions of the applicants for interview shall be final and binding. No correspondence will be entertained in this regard. However, the mode of selection for all the above posts will be at the sole discretion of Kendriya Vidyalaya Sangathan and may be changed before the date of start of the online application with due notification. The final merit list of PGTs, TGTs and Primary Teacher will be based on the performance of the candidates in written test and interview. The weightage of written test and interview will be 85:15 for the post of PGTs, TGTs & Primary Teacher. (b) The Written Examination for the recruitment to the above mentioned posts is likely to be held at following 18 cities. However, the KVS reserves right to conduct the written test at all the cities or any one or more of the cities depending upon the number of the candidates and other compulsions. Number of centers in each city will depend upon the number of candidates opting for a city. Note: The centres for the examinations as mentioned above are subject to change at the discretion of the Sangathan. While every effort will be made to allot the candidates the centre of his/ her choice for the written examination, the Sangathan may at its discretion allot a different centre to the candidate in case sufficient candidates do not opt for a particular centre or more candidates opt for the same centre than the capacity for any post or for any other administrative reason (s). No request for change of examination centre once allotted will be entertained and the candidate will have to appear at the allotted centre at his/ her expenses. (c) Candidates with disability of 40% or more, if they need Scribe, will have to bring their own scribe to assist them in the examination. There is no restriction with regard to educational qualification or age etc. for the scribe. Compensatory time to be allowed for all candidates with disability of 40% or more is 20 minutes per hour of examination. Reservation of vacancies for persons with disabilities will be given as per the Govt. of India rules. Part-I 1. General English 2. General Hindi 20 20 20 20 3 Hrs. (g) Based on the performance in written examination and also keeping in view the number of vacancies, the candidates will be called for interview. Intimation to this effect will be uploaded on the KVS website www.kvsangathan.nic.in. Candidates are required to check the KVS website from time to time. Taking into account the performance of both written examination and interview, merit list will be prepared in case of PGTs, TGTs and Primary Teacher. However the mode of selection will be the sole discretion of Kendriya Vidyalaya Sangathan and subject to change. Candidates may apply online through website. i. Candidates are required to apply Online through Kendriya Vidyalaya Sangathan web-site at www.kvsangathan.nic.in. No other means/mode of application will be accepted. ii. Candidates are required to have a valid personal email ID. It should be kept active during the currency of this recruitment. The Kendriya Vidyalaya Sangathan through its exam conducting agency may send call letters for written test, interview etc. through the registered email ID or the same may be downloaded from the designated portal. Under no circumstances, he/she should share/ mention email ID to/ or of any other person. iv. Carefully fill in the complete details in online application form. Scan and upload your recent photograph and signature at the appropriate places as per instructions contained in the online application format and submit the same in Online. Registration number would be generated on successful submission of application and will be displayed on the screen. Candidates are advised to note down their Registration number for future use. v. Candidates submitting their online application form Internet-cafe shall doubly ensure uploading of their recent photograph and signature. Mistake, if any can not be changed after submission of online application. vi. No fee is required to be paid by candidates belonging to SC / ST / PH categories and Ex-Service men candidates; hence the steps for payment of fees will not be applicable to them in online application form. Once the fee is deposited the same shall not be refunded under any circumstances. viii.The candidates should take a printout of the online application, affix a recent passport size photograph and preserve it with them for their record. The application printout with photograph affixed will also have to be submitted during document verification at the time of interview alongwith the self attested copies of certificates in support of Age, Qualification, Experience, Caste, Caste Validity, Non Creamy Layer, Physical disability, etc. as applicable. ix. The name of the candidate , Date of Birth and his/ her Parents’ name etc. should be spelt correctly in the application as it appears in the class X certificates/ mark sheets. Any change / alteration found may disqualify the candidature. xi. A candidate may apply for more than one post if he is eligible and desires to do so. In such cases, the candidate will have to pay the requisite Fee for all the posts applied for. However, within PGT / TGT categories, a candidate shall apply only in one subject.